The Novena will begin on Good Friday, April 19. We can make this novena for our personal intentions, for others and for the souls in Purgatory. Most Merciful Jesus, whose very nature it is to have compassion on us and to forgive us, do not look upon our sins but upon our trust which we place in Your infinite goodness. Receive us all into the abode of Your Most Compassionate Heart, and never let us escape from it. We beg this of You by Your love which unites You to the Father and the Holy Spirit. Eternal Father, turn Your merciful gaze upon all mankind and especially upon poor sinners, all enfolded in the Most Compassionate Heart of Jesus. For the sake of His sorrowful Passion, show us Your mercy, that we may praise the omnipotence of Your mercy for ever and ever. Amen. Most Merciful Jesus, from whom comes all that is good, increase Your grace in men and women consecrated to Your service, that they may perform worthy works of mercy; and that all who see them may glorify the Father of Mercy who is in heaven. Eternal Father, turn Your merciful gaze upon the company of chosen ones in Your vineyard-upon the souls of priests and religious; and endow them with the strength of Your blessing. For the love of the Heart of Your Son in which they are enfolded, impart to them Your power and light, that they may be able to guide others in the way of salvation and with one voice sing. Most Merciful Jesus, from the treasury of Your mercy You impart Your graces in great abundance to each and all. Receive us into the abode of Your Most Compassionate Heart and never let us escape from it. We beg this of You by that most wondrous love for the heavenly Father with which Your Heart burns so fiercely. Eternal Father, turn Your merciful gaze upon faithful souls, as upon the inheritance of Your Son. For the sake of His sorrowful Passion, grant them Your blessing and surround them with Your constant protection. Thus may they never fail in love or lose the treasure of the holy faith, but rather, with all the hosts of Angels and Saints, may they glorify Your boundless mercy for endless ages. Amen. Most Merciful Jesus, Goodness Itself, You do not refuse light to those who seek it of You. Receive into the abode of Your Most Compassionate Heart the souls of those who have separated themselves from Your Church. Draw them by Your light into the unity of the Church, and do not let them escape from the abode of Your Most Compassionate Heart; but bring it about that they, too, come to glorify the generosity of Your mercy. Eternal Father, turn Your merciful gaze upon the souls of those who have separated themselves from Your Son’s Church, who have squandered Your blessings and misused Your graces by obstinately persisting in their errors. Do not look upon their errors, but upon the love of Your own Son and upon His bitter Passion, which He underwent for their sake, since they, too, are enclosed in His Most Compassionate Heart. Bring it about that they also may glorify Your great mercy for endless ages. Amen. Most Merciful Jesus, You yourself have said, “Learn from Me for I am meek and humble of heart.” Receive into the abode of Your Most Compassionate Heart all meek and humble souls and the souls of little children. These souls send all heaven into ecstasy and they are the heavenly Father’s favorites. They are a sweet-smelting bouquet before the throne of God; God himself takes delight in their fragrance. These souls have a permanent abode in Your Most Compassionate Heart, O Jesus, and they unceasingly sing out a hymn of love and mercy. Eternal Father, turn Your merciful gaze upon meek souls, upon humble souls, and upon little children who are enfolded in the abode which is the Most Compassionate Heart of Jesus. These souls bear the closest resemblance to Your Son. Their fragrance rises from the earth and reaches Your very throne. Father of mercy and of all goodness, I beg You by the love You bear these souls and by the delight You take in them: Bless the whole world, that all souls together may sing out the praises of Your mercy for endless ages. Amen. Most Merciful Jesus, whose Heart is Love Itself, receive into the abode of Your Most Compassionate Heart the souls of those who particularly extol and venerate the greatness of Your mercy. These souls are mighty with the very power of God Himself. 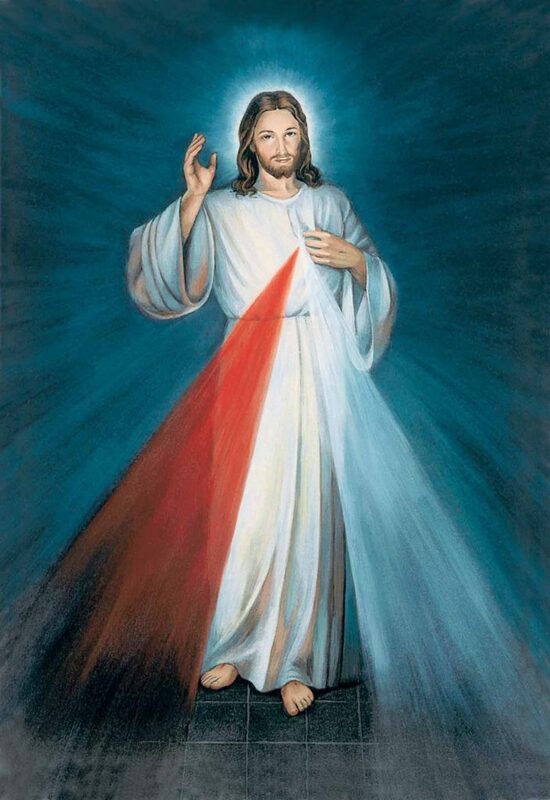 In the midst of all afflictions and adversities they go forward, confident of Your mercy; and united to You, O Jesus, they carry all mankind on their shoulders. These souls will not be judged severely, but Your mercy will embrace them as they depart from this life. Eternal Father, turn Your merciful gaze upon the souls who glorify and venerate Your greatest attribute, that of Your fathomless mercy, and who are enclosed in the Most Compassionate Heart of Jesus. These souls are a living Gospel; their hands are full of deeds of mercy, and their hearts, overflowing with joy, sing a canticle of mercy to You, O Most High! I beg You O God: Show them Your mercy according to the hope and trust they have placed in You. Let there be accomplished in them the promise of Jesus, who said to them that during their life, but especially placed at the hour of death, the souls who venerate this fathomless mercy of His, He, Himself, will defend as His glory. Amen. Most Merciful Jesus, You Yourself have said that You desire mercy; so I bring into the abode of Your Most Compassionate Heart the souls in Purgatory, souls who are very dear to You, and yet, who must make retribution to Your justice. May the streams of Blood and Water which gushed forth from Your Heart put out the flames of Purgatory, that there, too, the power of Your mercy may be celebrated. Eternal Father, turn Your merciful gaze upon the souls suffering in Purgatory, who are enfolded in the Most Compassionate Heart of Jesus. l beg You, by the sorrowful Passion of Jesus Your Son, and by all the bitterness with which His most sacred Soul was flooded: Manifest Your mercy to the souls who are under Your just scrutiny. Look upon them in no other way but only through the wounds of Jesus, Your dearly beloved Son; for we firmly believe that there is no limit to your goodness. Most compassionate Jesus, You are Compassion Itself. I bring lukewarm souls into the abode of Your Most Compassionate Heart. In this fire of Your pure love let these tepid souls, who like corpses, filled You with such deep loathing, be once again set aflame. O Most Compassionate Jesus, exercise the omnipotence of Your mercy and draw them into the very ardor of Your love, and bestow upon them the gift of holy love, for nothing is beyond Your power. Eternal Father, turn Your merciful gaze upon lukewarm souls who are nonetheless enfolded in the Most Compassionate Heart of Jesus. Father of Mercy, I beg You by the bitter Passion of Your Son and by His three-hour agony on the Cross: Let them, too, glorify the abyss of Your mercy. Amen.